1. Download content of XML file as string using WebClient class. 3. Bind parsed result as item source of Data Grid. Put your XML File in ClientBin folder. You can put XML file at any server location but in that case you will have to provide absolute URI of the XML file while downloading or reading XML file. I am going to create a simple page. This page is going to have a Button and a Data Grid. 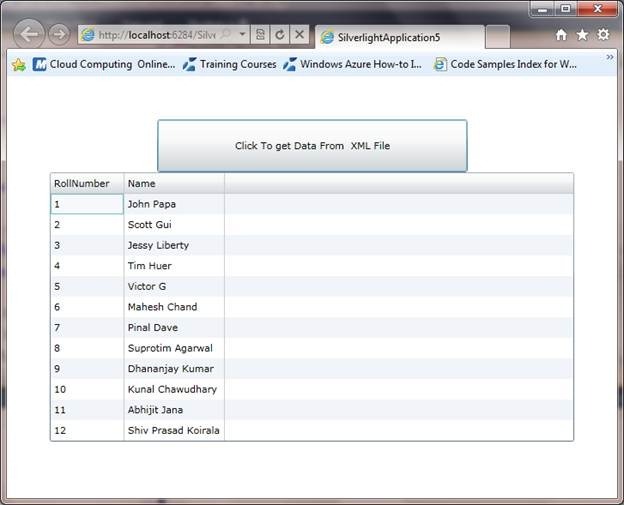 On click event of the Button, Data from XML file will get bind to Data Grid. I am using WebClient class to download content of XML file as string. On button click event downloading content of XML file. Do not forget to include namespace System.Net to work with WebClient class. We are going to use LINQ to XML to parse data. Include Namespace System.Xml.Linq . To parse data from xml file , we have written below function . 1. Function is taking string as input parameter. Here we will pass e.Result from Downloadcompletedstring event. 3. Reading each descendants or element on Xml file and assigning value of each attribute to properties of Entity class (Student). We need to create an Entity class to map the data from XML File. 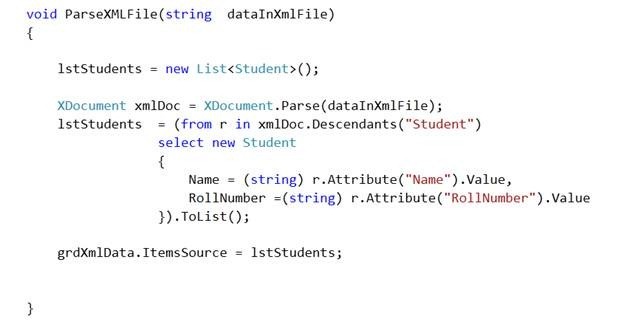 I am going to create a class Student with properties exactly as the same of attributes of Student Element in XML file. I mean I can’t seem to read it online.